This is such a fun bathroom wall. The center bottom hanger is very unusual. I couldn't get it off my mind. You never know what you may find in my garage. I spied some old wooden hangers on a clothes rod while getting in my car to go to work on Friday. The wheels were turning on the car and in my mind. After lunch today I had to take a closer look at those hangers. There were actually quite a few but many where the same type. I needed some variety. I liked this hanger because it had printing on it. "For cleaning or pressing, Call the Valet Department". It's from the Curtis Hotel in Minneapolis, Minnesota. One thing I remember about the Curtis Hotel is that hockey fans from our town stayed there when our high school team went to the state tournaments. This is a darker wood hanger that has printing on it in ink pen. It says "Ruby M Olson, 9th grade". Don't know Ruby. No wood on this one. I think it's from skirts or trousers. This one is made by the Henry Hanger Co., NYC. I doubt hangers have been made in New York City or even the USA for quite some time. The top one has a round wooden piece, and the bottom one is from "Lovering's, St. Paul, Minnesota". Also says Dale 0540, Phoenix Products, Milwaukee. The last one is a heavy gauge wire hanger with wooden clothespins that cannot be removed from the hanger. I think I have a good start on a hanger wall, but maybe I need one with a little more character! Carlene, I love old hangers. Have actually been on the look out for a few. I think you have a fabulous variety. Wonder if Ruby is my relation? lol! My hubby did have an Aunt Ruby, but her last name was Beckstead. I had to laugh when you said you never know what you will find in your garage. The same here. 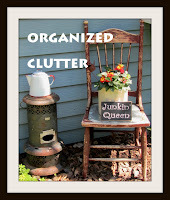 I need to let go of a lot of clutter in there, but I guess a clean garage is a boring garage!! 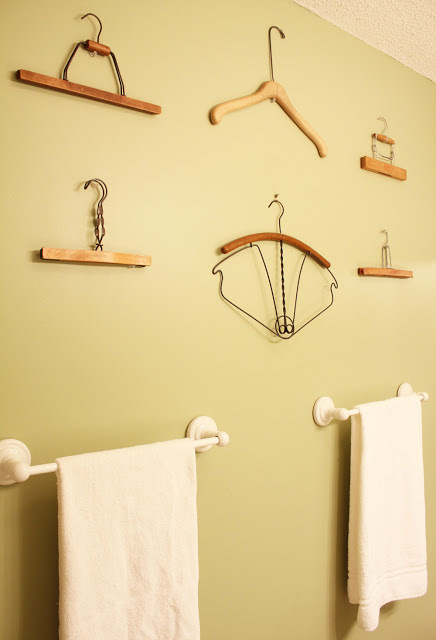 OH I think those have lots of character...the Curtis Hotel hanger is a real goodie! Thanks for the sweet shout-out! I think you have a wonderful collection of hangers that would look great on a wall. I grab every old hanger I find when pickin'. I just like the look of them. You have an excellent start on a hanger wall. I've never seen a hanger like Linda has on her wall, but I'll be sure to keep an eye out for one for you. Wow now you have me thinking as well.. I never took a good look at hangers until I read this post.. They can be unique! Your wall is coming along great..
Love the hanger wall. The middle bottom style is so unique. Looks like you have a great variety and collection already! Love your old hangers. Did not realize there were so many different kind. I have a metal folding one that I love, but no cute way to display it. Looking forward to inspiration from you. Great collection..loved the dark wooden one.. Such a fascinating collection, Carlene!